Drake and Future reunited on stage during the latter’s appearance at Coachella. The pair have collaborated in the past on joint mixtape ‘What A Time To Be Alive’, as well as individual tracks from both artists’ own catalogues. Together, they played some of those collaborations for Future’s audience in Indio yesterday (April 15), as Drake joined the Atlanta rapper to play three songs – ‘Jumpman’, ‘Gyalchester’ and ‘Fake Love’. Watch footage of the performances below, via Brooklyn Vegan. Weekend one of Coachella wraps up today (April 16) with a headline performance from Kendrick Lamar, plus appearances from Lorde, Future Islands, New Order, Skepta, Kehlani and more. The second day of the festival was headlined by Lady Gaga, who debuted a new song called ‘The Cure’ during her set. Lauryn Hill was amongst the surprise appearances of the day, playing Fugees songs with DJ Snake. 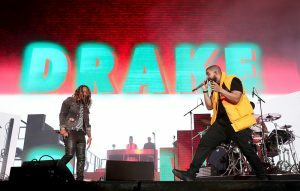 The post Watch Drake join Future on stage at Coachella appeared first on NME.